Welcome to our Family Web Site. Things have been pretty difficult since the move back to Arizona but we're hanging in there! Brenna is enjoying school and doing very well, participating in a local POM & Cheer class and Girl Scouts. Check out the other pages in the site for pictures, updates, etc. Coming Soon...the newest addition to our family. 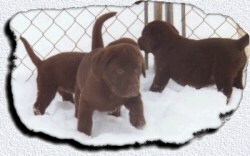 Next month our new puppy will be old enough to come home with us. Stay tuned...actual photos of our pup coming soon!